When considering the purchase of a new scanner, a facility must focus not only on today’s needs, but on needs over the next 10 years. We are seeing purchasing departments take this exact approach more and more these days. As reimbursement is falling across the radiology space year by year, many facilities are making their capital equipment purchases for the long haul. We are seeing very few system purchases in the 16-32-slice count categories due to scalability and dose. Such systems are purchased mainly for clinics or as a secondary system to back up the primary, higher-slice-count system. 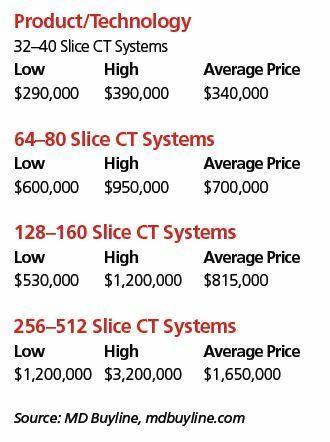 We have seen a big increase over the past year in interest in the 64-slice and above market. Many facilities are taking advantage of end-of-quarter/end-of-year savings and multiple promotions offered by the quoting vendor that can help offset the cost of the overall system. The end of the fiscal year can often yield the best prices of the year from a vendor. Also, don’t be afraid to let the prospective vendor know you’re looking into other vendors; this can add to deeper discounting to get your business. We have seen many facilities previously known to buy their CT systems from only one vendor leave that relationship for a better price and sometimes a better system. Also make sure the vendor identifies the price for the trade-in. With this information it is easier to know the true purchase price of the system. Often an included trade-in can falsely increase the discount by 10 percent. Your knowledge of the market and your negotiation skills are key to getting the best discount. Market research can be done through benchmarking companies or through a Request for Information (RFI) or Request for Quotes (RFQ). The information from these documents can help to educate your purchasing and/or departmental staff about the offerings of multiple vendors, thereby guiding the team to the right system to purchase. It is important to know the scalability of the systems of interest, as this will aid in determining if the system you are interested in is right for your facility over the long term. Another important factor is the availability of advanced scanning applications for cardiac, vessel, and metal artifact reduction. These applications are some of the most common items on quotes we see from various vendors. As always, when purchasing capital equipment, you will need service for that system. Some years back, there was a trend toward entrusting service to the in-house BioMedical Service Engineer (BME) department. In today’s market, we are seeing more hospitals opt for full-service contracts from the vendor instead. When looking at service contracts, make sure that your tube metrics are within range of the patient volume that you are currently processing and that the metrics represent what your usage will be with an improved workflow with the new system. Also keep in mind that the vendor has an overage fee if you exceed the tube metrics. This fee needs to be outlined in all documentation that accompanies your CT system. This will help you avoid costly overage fees. You also need to make sure all equipment – not just the tube – is covered: for example, ECG cables, injectors, and UPS systems that are attached to the scanner. Please note that these numbers have been adjusted to exclude special deals, outliers, and unique circumstances. About the author: Cris Bennett is clinical analyst at MD Buyline.